This post essentially puts twenty bucks in your pocket if you need a chronograph. You see the MagnetoSpeed Sporter Chrono typically costs around $179.00 from most vendors. But right now MidwayUSA is running a special — the true “shopping cart price” is $159.99. That’s $20.00 cheaper than Midway’s regular price, and $19.01 cheaper than the lowest price we found anywhere else. But you better act quick — this kind of special “Shopping Cart Discount” won’t last long. We confirmed Midway’s $159.99 price on the morning of April 28, 2018. Strapped on your barrel, the MagnetoSpeed Sporter records velocities accurately without requiring any hardware to be placed downrange. Everything is self-contained at your shooting station, so you no longer have to waste time setting up tripods and aligning the bullet path through old-fashioned chrono skyscreens. For most shooters, the MagnetoSpeed Sporter is all they need — they don’t need to spend $380.00 for the Deluxe MagnetoSpeed V3 Model. Here’s a video review which compares the Sporter to the more expensive V3 chronograph. 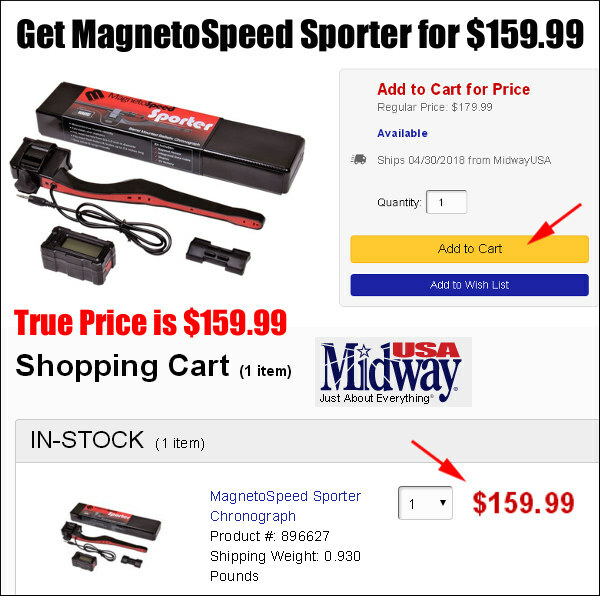 Share the post "Save $20 on MagnetoSpeed Sporter Chronograph — $159.99"